In a state with colorful history, a collision of cultures and independent spirit, Texas has many eclectic shops that reflect its characteristics. Whether shoppers are looking for a true one-of-a-kind piece, a vintage collectible or a designer must-have, they are sure to find it in Texas. In Dallas, the Bishop Arts District is the perfect place to find that unique piece to set an outfit or room apart from the rest. Favor The Kind, a place to find home accessories, gifts and apparel offers affordable fashion with a Texas twist. Between the numerous racks of tops and stylish dresses, shoppers will find designer cowboy boots and leather-fringed handbags. For shoppers that get a thrill from finding classic vintage pieces at a bargain store price, Dolly Python has one of the biggest and most diverse collections with everything from mid-century furniture, antique clothing, vintage vinyl and more. In the capitol city that prefers to keep things weird, Austin is home to numerous vintage and one-of-a-kind treasures. Near downtown on South Congress Avenue lies a slew of vintage shops including Feather&apos;s Boutique, which was named the best vintage shop in the country by Elle magazine and offers diverse selection of women&apos;s clothing from the 1920s through to the 1990s. Just a few shops down is Uncommon Objects, a wonderland that is home to a carefully curated collection of Pinterest-worthy finds that will make any do-it-yourself shopper swoon. South Congress is also home to the Kendra Scott flagship store which holds the jewelry and accessory collection designed by the Austin native. While shopping for a cause, why not sip for one too? The Austin TOMS store includes a cafe serving coffee from TOMS Roasting Co. For every bag of coffee purchased, TOMS will give one week of clean water to a person in need. Head to San Antonio to enjoy the sights and flavors of old Mexico at Historic Market Square, a favorite of locals and tourists for generations. Explore over 100 locally owned shops and stalls for authentic Talavera pottery, exotic curios and handcrafted works of art, all at a festive indoor mall famously described as the largest Mexican market outside Mexico. Trying to find something unique? Texas is the place to find it. If you&apos;re in the mood for some serious antiquing, head to Canton to experience their First Monday Trade Days. The oldest flea market in the state, established in 1850, occurs the weekend before the first Monday of each month. For the largest antique destination in the state, head to Round Top for the Round Top Antiques Fair, which sprawls across several small towns and attracts more than 100,000 shoppers at shows in the spring and fall. 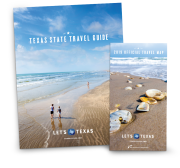 Wherever you go, Texas has what you&apos;re looking for.